Context Therapeutics is dedicated to creating new medicines to treat hormone-responsive (HR+) cancers. We seek to become a global company that will discover, develop and market groundbreaking cancer treatments to patients around the world, eliminating the fear that comes with a cancer diagnosis. Context’s lead program is Apristor®, an investigational Phase 2 drug that is being developed for progesterone receptor positive (PR+) cancers. Hormone receptor positive (HR+) cancers, including breast, uterine (endometrial), and ovarian cancers are poorly addressed and result in over 75,000 deaths per year in the United States. HR+ cancers are driven by the binding of hormones (e.g., progesterone) to their partner receptors (referred to as “nuclear receptors”). HR+ cancers are poorly responsive to immune oncology (“I-O”) therapeutics due to the inherent “cold” nature of HR+ cancers, lack of cell surface targets, and limited production of neoantigens. Nuclear receptors are a class of transcriptional regulatory proteins. We are focused on a subset of these receptors that are activated by hormones, in particular the progesterone receptor which is activated by progesterone. 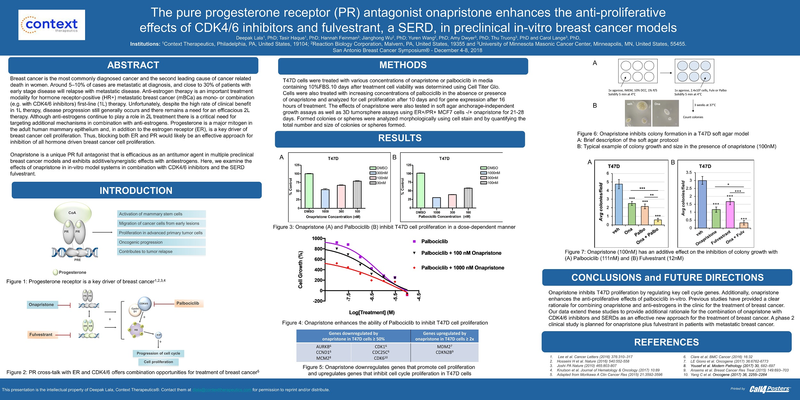 Progesterone receptor is enriched in breast, ovarian, and endometrial cancers. Patients are said to be PR positive when > 10% of the cells in their tumor express PR. Unlike existing PR-targeting drugs, only Apristor is selective for PR and has shown robust monotherapy clinical activity. Nuclear receptors, including the progesterone receptor (PR), are attractive targets for hormone-driven cancers. However, developing therapeutics that selectivity block specific nuclear receptors while retaining sufficient oral bioavailability has limited the potential of this therapeutic class. Several companies have emerged - the 3rd Generation nuclear receptor companies - to address limitations of prior generations. Context Therapeutics is a leader in nuclear receptor drug development, with a particular focus on developing progesterone receptor antagonists.